You've found the “U.S. Wyandotte Chicken Breeders” page here at Hobby Farm Wisdom! If this is the first time you have visited our site: Welcome! Wyandotte chickens are a breed originating in the United States in the 1870s. They are considered a dual-purpose bird since they are good egg layers and produce a quality meat. Wyandotte chickens are also a popular show breed. Hens will produce an average of 200 brown or tinted eggs per year and go broody more often than other breeds. They fare exceptionally well in winter and many continue to lay eggs. Their excellent egg production combined with their friendly temperament and beautiful coloring makes them a popular backyard variety. 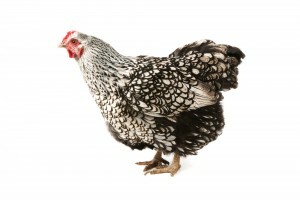 Wyandotte is a medium sized chicken with a rose comb; there are eight colors accepted by the American Poultry Association, including buff, buff Columbian, Columbian, black, blue, golden laced, partridge, silver laced and silver pencilled.